This is a light soup, good hot or cold, made from garden tomatoes. It’s adapted from Vegetable Literacy by Deborah Madison, who says her favorite tomato for this soup, is Cherokee Purple, but it tastes great with any fresh chopped tomatoes from the garden or farmer’s market. Once the tomatoes go in, it’s barely cooked so they’ll be as fresh as possible. Heat the oil in a soup pot over medium heat. Add the onion and celery and cook, stirring occasionally, until golden and limp, about 6 minutes. Add the cumin, coriander, paprika, and turmeric and cook, stirring occasionally, for 2 to 3 minutes before adding the cilantro and tomatoes. 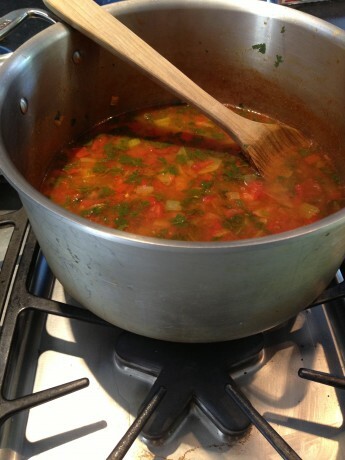 Season with 1-teaspoon salt, cook for a few minutes longer, then add 4 cups hot water to the pot and bring to a boil. Lower the heat and simmer for 10 minutes. Taste for salt. Ladle the soup into bowls, add a few tablespoons of quinoa to each bowl, season with pepper, and serve.